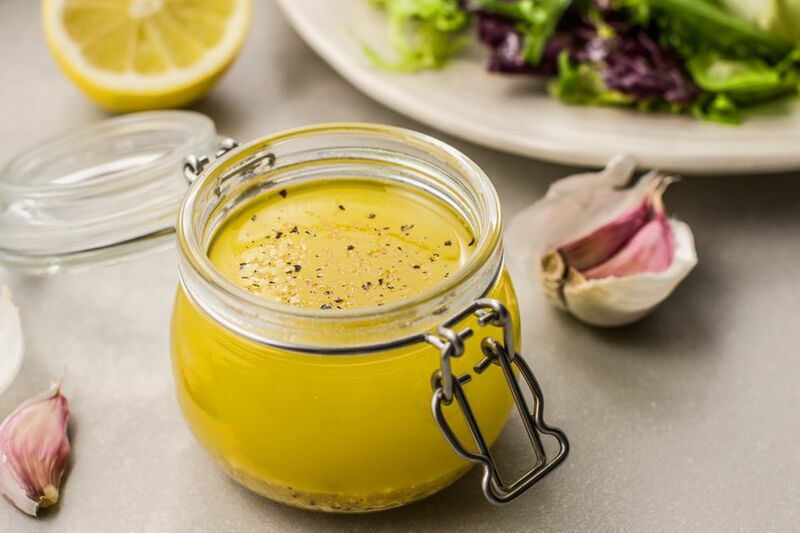 Try this simple, flavorful salad dressing and you may never buy bottled dressing again. Lemon and garlic bring a lot of zing to plain lettuce but feel free to add whatever veggies you like. Note that this recipe makes enough vinaigrette-style dressing for 4 to 6 cups of lettuce or other salad greens. Feel free to double, triple, or even quadruple it for larger salads or to have some on hand for salads over a few days. Peel and mince the garlic (you can use a garlic press if you like; presses tend to bring out the bitterness in garlic, but some people don't seem to notice it). Add the lemon juice, lemon zest, salt, pepper, and mustard. Whisk to combine everything (or seal and shake the jar). Whisk in the olive oil (or, again, seal the jar and shake it vigorously). Taste and adjust salt and pepper to taste. If the dressing is too zingy for you, feel free to add more olive oil to soften the flavor. A bit more salt will help temper​ the acid kick, too. Use the dressing immediately. If you've made the dressing in the salad bowl, just add the greens to that big bowl and toss! Or store, covered and chilled, up to 1 week. The olive oil will solidify in the refrigerator, but it will melt quite quickly when set out at room temperature again. Zest the lemon before cutting it in half to juice it. Make the dressing for a salad later that day in the bowl, top with washed and dried greens, and lay a damp (but not wet) paper towel over the leaves. Keep chilled until ready to serve, up to 6 or 8 hours. Add 1 or 2 tablespoons of fresh minced herbs—parsley, mint, chervil, or dill are excellent choices. Use walnut oil or avocado oil instead of olive oil. Tone down the lemon flavor by leaving out the lemon zest, or mix up the flavor with a bit of orange zest. Punch things up by using 1/2 teaspoon Dijon mustard instead of the ground mustard.